Автор: Aye A.K., Eddie C.F.C.A.Z.A.M. 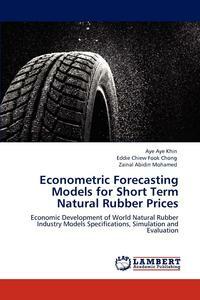 This study presents a number of short-term ex-post forecasts of single equation model, Multivariate Autoregressive Moving Average (MARMA) model, simultaneous supply-demand and price system equation model, and Autoregressive Integrated Moving Average (ARIMA) model, and ARCH-type models of natural rubber (NR) SMR20 (Standard Malaysia Rubber of grade 20) prices in the world NR market. The ARCH-type models (Autoregressive Conditional Heteroskedasticity) used include the GARCH (1,1) (Generalized ARCH) model, EGARCH (1,1) (The Exponential GARCH) model, PARCH (1,1) (The Power ARCH) and CGARCH (1,1) (The Component GARCH) model. The models were utilized using monthly data from January 1990 to December 2008 as estimation period, providing a total of 228 observations and data was used as an ex-post forecasts. The results revealed that the forecasting performance of the simultaneous supply-demand and price system equation model was more efficient than single equation model, MARMA model and ARIMA model, and ARCH-type models for ex-post forecast in estimating the price of SMR20 in the next 6 months or so.